Our Jasmine are picked in the afternoon and placed in layers over tea when the jasmine blooms at night they are infused over 4 hours and the process is repeated 4 times until morning. 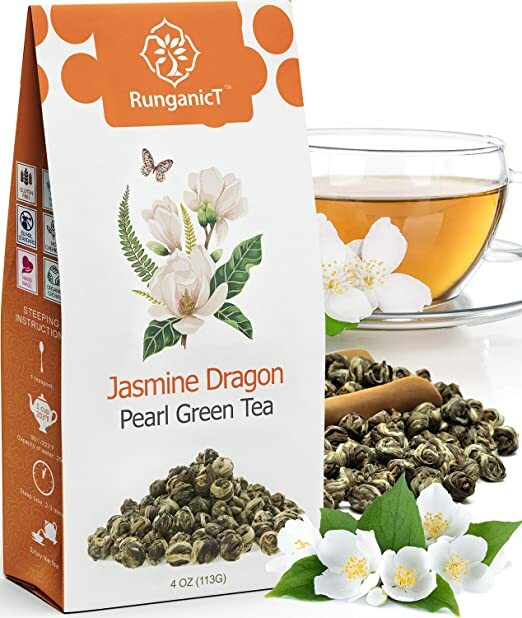 STRONG AUTHENTIC TASTE & AROMA :: Unlike other brands where the pearls are only scented 2 to 3 times our green teas are scented 4 times. Making the refreshing tender aroma of jasmine far more superior. Because of this you only need 3 quarters of what pearls to get the sophisticated delicacy of jasmine green tea. What does this mean? You’re saving money & getting a premium quality tea at the same time! SUPERIOR! HAND MADE WITH CARE :: These are artisanal dried green tea leafs picked by 4th generation tea farmer in the hills of Fuijin China, sent to be roasted and scented in an ancient Chinese shop where the tea goes through scenting and rolling. 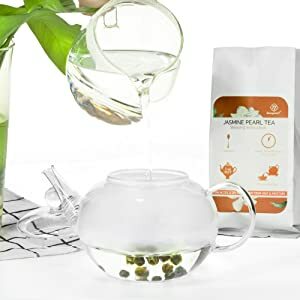 BREWING THE PERFECT EXPERIENCE :: Best way to brew Jasmine pearl green tea is to use hot water 175 to 185 F poured over a tea pot with the pearl teas wait for about 3 minutes to enjoy the perfect jasmine scent green tea. 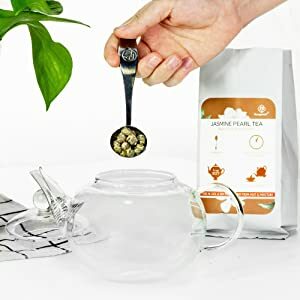 IMPORTANT: Using boiling water will cause the tea to taste a little bitter and ultimately spoil the experience. For Standard Tea Pot 1 Cup (250ml) 1 teaspoon of pearls. Why? Not only Boiling Water ruins the aromatic taste and gives a bitter flavor to the tea but also destroys nutrition and benefits of green tea. 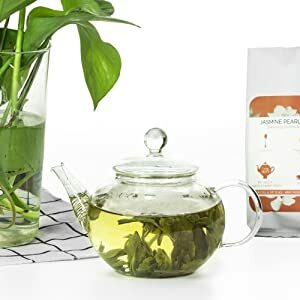 Best way to enjoy the afternoon is a sip of jasmine pearl tea, it not only has a relaxing fragrant but also uplifting aroma that brightens up a gloomy day giving that nostalgic enjoy of spring. For the perfect tea experience, drink in 3-5 minutes after brewing. You can separate the tea from the pot or pour them into a cup to drink as cold tea.